When it comes to lunch, I'm a sandwich guy. I eat a sandwich for lunch almost every day, and it's to the point where if I don't eat a sandwich, I feel like I'm missing something. It doesn't matter how delicious the leftovers are from last night's dinner, when it comes to lunch today, I'd rather have a peanut butter and jelly (which is pretty much what I eat every weekday - not that soggy jelly on wonder bread kind of sandwich though, I never did dig that). If there is bread available at any meal, I pretty much always make a sandwich. My perfect eating day begins with an egg sandwich, continues with a fresh mozzarella, tomato, and basil sandwich on fresh ciabatta, and ends with a burger (which may or may not be a sandwich, but it's close). I've eaten sandwiches from tons of different restaurants, delis, lunch trucks...you get the idea, and there's invariably one thing that sets apart a good sandwich from a great sandwich, no matter what the filling, and that of course is the bread. When it comes to my weekday sandwich, which as I said is usually PB & J, but occasionally could be something like egg salad, leftover chicken, or other leftover meats, I'm looking for a bread that is whole grain and nutritious without being overly dense and dry. I've been eating Stop & Shop's Nature's Promise Whole Wheat Bread pretty consistently for about a year now, and while it's very good bread, I still have that feeling that I could be doing better. One of my goals when I got into bread baking a few months ago was to one day be baking my sandwich bread on a weekly basis. Towards that end I've begun trying out some enriched dough, loaf bread recipes. Enriched means that the dough is made richer and more flavorful by the addition of milk, eggs, butter, fruit, etc. as opposed to just using flour, yeast, and salt and relying on fermentation and enzyme action to coax sugars out of the wheat for flavor. I started last week with the whole wheat bread recipe on the back of the King Arthur Flour bag. It had a very noticeable wheat flavor that's almost completely absent from the bread I'd been eating, which I enjoyed immensely. The bread was a bit on the dense side, but not dry at all and still in the acceptable part of the denseness spectrum (which only exists in my mind). I will be making it again in the future. Today I tried another recipe, Oatmeal Bread. I got the recipe for this bread on a site called The Fresh Loaf where is was posted by another site user who got it originally from The Laurel's Kitchen Bread Book. When reading over the recipe I noticed that it called for oatmeal made with steel cut oats rather than rolled oats. No problem there, as steel cut oats are a frequent Saturday morning breakfast at my house. So about 6:30 this morning I got up and made a batch of oatmeal (which takes about 45 minutes), reserved a cup for the bread, mixed the rest with some bananas and maple syrup and gave it to my wife and daughter (none for me because I'm still eating bagels from the batch I made on Thursday). Mix the dry ingredients (whole wheat flour, dried milk, salt, yeast) in one bowl and the wet ingredients (oatmeal, water, oil, honey) in another. Combine the wet with the dry (the recipe said to add the dry to the wet, but I had already mixed the dry in the larger bowl, so I did the opposite - I don't think it made a difference) and stir to loosely combine all the ingredients. This makes quite a crumbly mixture that doesn't really resemble dough yet. Dump the flour mixture onto the counter and knead. The dough begins to come together after a few minutes and after about 10 minutes of kneading, form the dough into a ball. Place the ball of dough in a bowl, cover it and allow it to rise in a warm spot for about 2 and 1/2 hours. Test the dough by poking it . If the depression does not spring back quickly, the dough is good to go. Put it on the counter and prepare to fold it by giving it a stretch into a rough rectangle shape. Try not to handle the dough to roughly. Fold the dough down and then up, from the left to the right and finally from the right to the left. 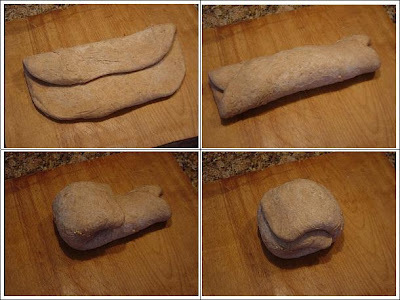 There are some good videos and written instructions showing and describing the stretch and fold method at the Sourdough Home Website. Form the dough back into a ball, put it back in a bowl, cover and allow it to rise for another hour. Form the dough into a bread pan loaf. I used the technique described in Peter Reinhart's Bread Baker's Apprentice. Basically you stretch the dough into a rectangle and roll it up from one of the narrow ends. 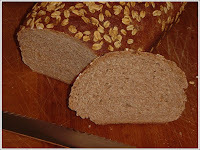 Roll the top of the bread in some rolled oats soaked in milk, then place it in an oiled 8 1/2 by 4 1/2 inch loaf pan. As you can see, I rolled my loaf a bit small. It should be touching both ends of the pan to ensure a more even rise, but I didn't re-roll it. Once again cover the dough and allow it to rise one final time until the dough crests about 1 inch above the pan. For me, this took about 2 additional hours. At least 1/2 hour before baking, you want to preheat your oven to 350 degrees. Put the bread in the oven and bake it for 45 to 55 minutes. An amazing aroma will begin to permeate your house almost immediately, which is one of the great joys of making bread at home. The best way to tell when it's done is with a digital, instant-read thermometer. You're looking for 190 degrees in the center of the bread. For me this took 45 minutes. Remove the bread and cool completely on a rack (at least 1 hour) before slicing. This bread smelled great when it was baking, looked great when it came out of the oven, and tasted wonderful upon slicing. The flavor of the oats really adds an interesting dynamic that was absent in the straight whole wheat bread I'd made before. The honey does not dominate, but provides a subtle hint of sweetness in the background. I can't wait to make a sandwich. I'm really glad you enjoyed the bread! Fantastic blog, and a great visual write-up on how it's made. I was a teacher, myself, for three years and just recently (August) left my beloved New England for Oregon. I miss it, and miss the snow, but Oregon has its own charms. I don't teach any more, but, like you, I spend a lot of time cooking. 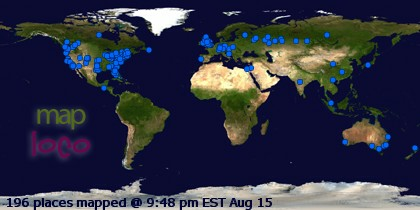 You're bookmarked, and I look forward to reading more! Thanks Jeff! The words of encouragement are greatly appreciated. I'll definitely be making that recipe again as we're enjoying it very much. I hear the northwest U.S. is a beautiful place to live. Good luck!